Assessment of the effects of climate change on groundwater recharge in the Galera Plain and Ebro alluvial aquifers in Spain by means of hydrological water balance models. Pisani Veiga B., Samper Calvete J. y Yanmei Li. The Baltoniodus triangularis Conodont Zone in the South American Lower-Paleozoic Central Andean Basin: the Alto del Cóndor Formation of northern Argentina. Determining the depth of Mohorovičić discontinuity in the Iberian Peninsula by using the Vening Meinesz inverse isostatic problem - A comparison with the seismic method. Hernández Moraleda, A. y Bethencourt Fernández, A. Systematic and biostratigraphic review of the genus Alueva Sdzuy, 1961 (Ellipsocephalidae, Trilobita, Cambrian). 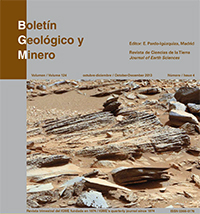 Dies Álvarez, M. E., Gozalo, R. y Liñán, E.
Marine and terrestrial palynofloras from transitional Devonian–Mississippian strata, Illinois Basin, U.S.A.
Wicander, R. and Playford, G.
Hydrochemistry and stratification of the Blondis lake: the “invisible fingerprint” of historical iron mining in La Arboleda (Bizkaia). Yusta, I. y Sánchez España, J.
Bartomeu Dader i Pericàs as eyewitness and chronicler of the Es Marroigs landslide in 1924 (Majorca). Analysis from current knowledge. Mateos, R. M., García-Moreno, I., Herrera, G., Roldán, F. J. y Palmer, E.